It should be pointed out that the clematis you plant today needs to be happy with the effort you put into its planting site for the next several decades. There are clematis over eighty years old still blooming marvelously. Clematis need a cool, moist, deep root run, plenty of water and regular, balanced feeding. A little special preparation will ensure the proper environment. Dig a hole eighteen inches deep by eighteen inches wide [45cm x 45cm x 45cm]. Cover the bottom with a good rich compost or well rotted manure. A hand full of bone meal mixed with your soil is always a good idea. Add enough topsoil to cover the compost; now you are ready to plant. Place your well watered clematis in the hole so that about six inches [15cm] of stem is below the soil line. The stem of your clematis needs to be ripe before you bury it. If you are concerned about this, leave the final filling of the hole until later in the season. The stem of the newly planted clematis needs to be securely but carefully attached to a support so that damage to the stem does not occur. 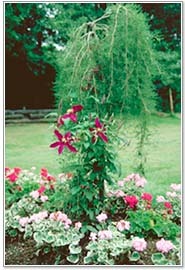 Planting a small shrub in front will insure a cool root run for the clematis.